Dillon Hut in the Taipo Valley is an absolute gem for kids, as far as we’re concerned. Warm, sandfly proof, so clean you won’t worry about your toddler eating off the floor. Access: From the end of the 4WD track, around 2hrs adult time. Approximately 6kmish from end of 4WD or maybe 8km from SH. River valley and 4WD track, mostly flat, ‘easy walk from road end’ according to DoC website. High level route (but we didn’t use it) avoids need to cross river. Hut features: Standard, 10 bunks. Log burner cranks out the heat, sandfly protection on windows, really clean. Family of weka outside the hut – adults and fluffy babies while we were there. 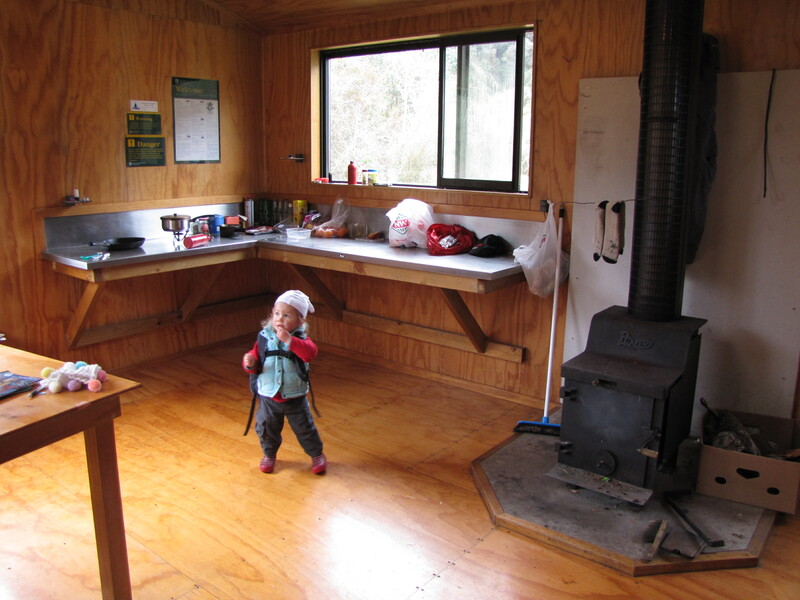 Other MAJOR plus is another hut very close meaning that other trampers can bail there if they don’t want to share the hut with your wonderful whanau. Sandfly levels were moderate (we were there in spring). Negatives: River crossing, reasonable strength at normal flow. There is a high level route but we didn’t use it. If without 4WD then add a decent hill plus another hour(?). This website is such a great idea, thank you! We are yet to get out for our first overnight with our 2 and 4 year olds, but it would be really helpful to hear some tips and tricks to making the whole experience a good one for all – have to admit that it’s a little bit daunting! Awesome site Thanks, We will be driving down the coast with our Toddler this summer so was great to read a few ideas.